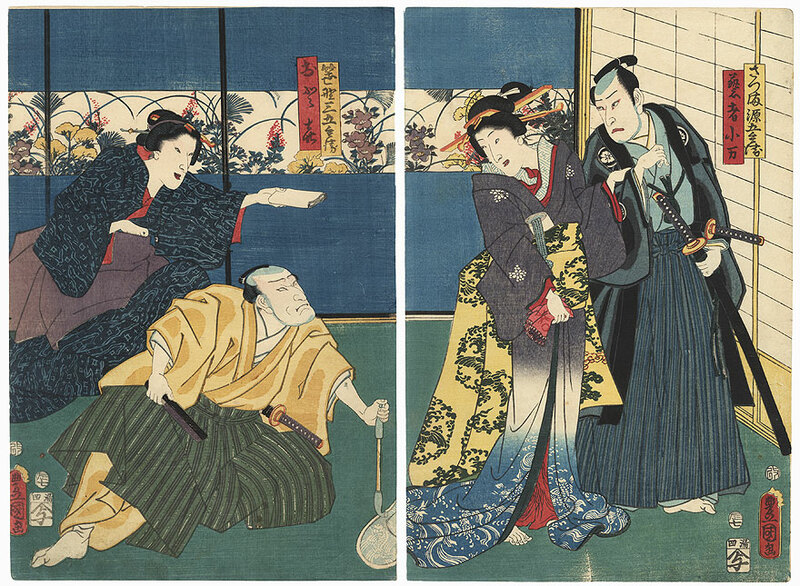 Comments - Handsome scene from the tragic love story of the ronin Satsuma Gengobei and his girlfriend, the geisha Koman, a play commonly known as "The Five Great Powers the Secure Love" (Godairiki). The evil samurai Sasano Sangobei is also in love with Koman, and he reacts angrily as the couple prepares to leave the room together. The beauty smiles sweetly back at her guest, but Gengobei frowns unhappily. 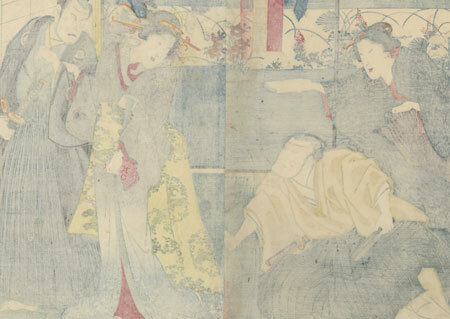 At left, the matron Oyasu holds out a roll of tissues to the departing sweethearts. The back of the room is lined with blue panels decorated with a band of colorful autumn flowers and grasses, with shoji windows at right. An attractive design, nicely colored and detailed. Condition - This print with excellent color and detail as shown. Two separate panels. A few creases and small spots, slight rubbing at edges. Please see photos for details. Good overall.